The ICS-3000 programmer allows the veterinarian to move freely as its notebook-like programming unit can be transported easily. The programmer is the ideal partner for flexible and convenient implantations and follow-ups of implantable cardiac devices. The programmer is intended for use as the programming and monitoring system for the Dextronix PetPacer-R and DR implantable pulse generators. It is compact and modular, offering numerous functions for initial programming and follow-up. Additionally, the pacing function of pacemakers made by other manufacturers can also be monitored. 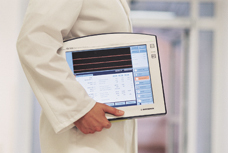 It features a real time display, data storage and printing of up to 3 ECG leads (surface ECG (Einthoven), esophagus lead and up to 3 intracardiac leads). Data transfer for documentation and later evaluation is easy with integrated thermo-printer, CD writer, USB and Bluetooth (optional).